It was good fun, last night (November 2), to watch a video in which a Nigerian Muslim imam told a feisty group of mostly Christian Kenyans that they best be about doing what their leader (Jesus) would like them to do. The means by which Imam Muhammad Ashafa, and his Pentecostal pastor fellow peacemonger, James Wuye, came to be advising some Kenyans, is today’s OttawaWatch topic. 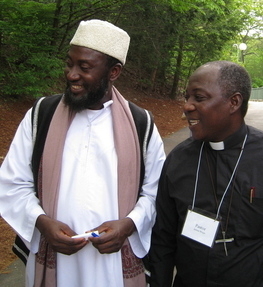 The imam and pastor were together in Ottawa, at St. Paul University. They were part of a panel moderated by Vern Neufeld Redekop, the Mennonite head of the Catholic university’s conflict studies department. The whole evening was initiated by Initiatives of Change (pun intended), described in its promo material as “a diverse, global network committed to building trust across the world’s divides. But back to the imam and the pastor. Imam Ashafa and Pastor Wuye used to be warriors in and around the Plateau province in central Nigeria, where Muslims and Christians were constantly waging turf battles and killing each other off in the process. Wuye, in fact, was a part of a Christian militia that fought off Muslim incursions into their communities. He has fair evidence of the battles: his right hand is obviously artificial and he good humoredly notes that the real thing was cut off in a hand-to-hand exchange with a Muslim opponent. There was something worth noting in the costuming of the two men, when they appeared in Ottawa. Wuye, a jaunty little fellow with a mischievous glint in his eye, sported a black suit with Roman collar and a small black fedora. Ashafa, lanky and almost scholarly, wore a white kaftan and, on his head, a white turban. Their “fashion statements” were meant to reinforce the point that both of them were strongly committed to their own particular faith perspectives. True, they have reached a common understanding that forgiveness leads to mutual respect and, indeed, the kind of filial love that leads to the cessation of hostilities. But Wuye has not left behind, his enthusiasm for leading people to Christ. And Ashafa maintains that a little “healthy competition” tends to lead to the sharpening of the devotional skills that bring out the best in his faith – as well as that of his friendly competitor. So how did Kenya get into this mix? It was in this context that Ashafa, the imam, with the full encouragement of Wuye, the Pentecostal pastor, was literally “teaching” these Christians the ways of Jesus, particularly as they related to the heretofore mentioned healing and reconciliation process. There was one more element to the story, as presented in Ottawa last night. It was that two videos were excerpted for the occasion: The Imam and the Pastor, which told the Nigeria story, and An African Answer, which recounted the Kenyan experience that followed. To Richard Weeks, who runs the IOC Ottawa operation, the presence in the room of a fourth man, Alan Channer, the British director of the two videos was significant. He represented the importance of story-telling, communication and media in spreading the word into other climes, about faith-based peace-making. If Channer had not been in the picture, the imam and the pastor would still be in Nigeria doing their thing. The rest of the world would not know about what that thing was. Many of my readers make the point that there is no such thing as a “moderate” Muslim, and that all true Pentecostals should be prepared to draw the sword on this “unholy enemy”. In telling this story, I can only note that, by all appearances, these once mortal enemies are now friends, congenial competitors – and agents of reconciliation. Go figure.